This month, the random number generator chose the word Unicorn, suggested by Katherine and Ange on Patreon. I went through a unicorn obsession in my early teens, so it gave me pleasure to see this word come up. I like the lace, too. 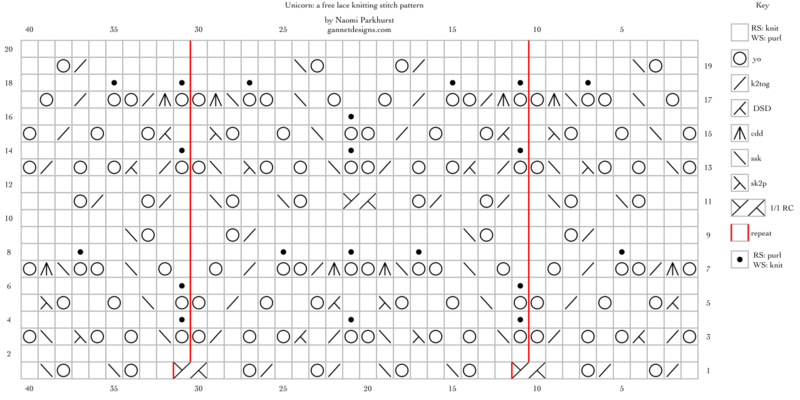 This chart works to make a simpler pattern and an offset pattern. The simpler pattern uses rows 1-10, and is repeated twice in the swatch, followed by rows 1-20. Then I worked rows 1-10 once more. Unicorn is a multiple of 20+20 stitches and 20 rows. Row 3: yo, k2tog, k1, DSD, (yo, k1) x 2, k2tog, yo x 2, *ssk, (k1, yo) x 2, sk2p, k1, ssk, yo x 2, k2tog, k1, DSD, (yo, k1) x 2, k2tog, yo x 2; work from *, ssk, (k1, yo) x 2, sk2p, k1, ssk, yo. Row 4: p9, *[(k1, p1) in double yo, p8] x 2; work from *, (k1, p1) in double yo, p9. Row 5: k1, DSD, yo, k2, yo, k1, k2tog, k1, yo x 2, *k1, ssk, k1, yo, k2, yo, sk2p, k2, DSD, yo, k2, yo, k1, k2tog, k1, yo x 2; work from *, k1, ssk, k1, yo, k2, yo, sk2p, k1. Row 6: p9, *(k1, p1) in double yo, p18; work from *, (k1, p1) in double yo, p9. Row 7: yo, cdd, k2tog, yo x 2, k1, k2tog, k1, yo, k1, *k1, yo, k1, ssk, k1, yo x 2, ssk, cdd, yo x 2, cdd, k2tog, yo x 2, k1, k2tog, k1, yo, k1; work from *, k1, yo, k1, ssk, k1, yo x 2, ssk, cdd, yo. Row 8: p3, (k1, p1) in double yo, p5, *p5, [(k1, p1) in double yo, p2] x 2, (k1, p1) in double yo, p5; work from *, p5, (k1, p1) in double yo, p3. Row 9: k6, k2tog, yo, k2, *k2, yo, ssk, k12, k2tog, yo, k2; work from *, k2, yo, ssk, k6. Row 11: k3, yo, ssk, k2, yo, ssk, k1, *k1, (k2tog, yo, k2) x 2, 1/1 RC, (k2, yo, ssk) x 2, k1; work from *, k1, k2tog, yo, k2, k2tog, yo, k3. Row 13: yo, ssk, (k1, yo) x 2, sk2p, k1, ssk, yo x 2, *k2tog, k1, DSD, (yo, k1) x 2, k2tog, yo x 2, ssk, (k1, yo) x 2, sk2p, k1, ssk, yo x 2; work from *, k2tog, k1, DSD, (yo, k1) x 2, k2tog, yo. Row 14: p9, *[(k1, p1) in double yo, p8] x 2; work from *, (k1, p1) in double yo, p9. Row 15: yo, k1, ssk, k1, yo, k2, yo, sk2p, k1, *k1, DSD, yo, k2, yo, k1, k2tog, k1, yo x 2, k1, ssk, k1, yo, k2, yo, sk2p, k1; work from *, k1, DSD, yo, k2, yo, k1, k2tog, k1, yo. Row 16: p10, *p9, (k1, p1) in double yo, p9; work from *, p10. Row 17: k1, yo, k1, ssk, k1, yo x 2, ssk, cdd, yo x 2, *cdd, k2tog, yo x 2, k1, k2tog, k1, yo, k2, yo, k1, ssk, k1, yo x 2, ssk, cdd, yo x 2; work from *, cdd, k2tog, yo x 2, k1, k2tog, k1, yo, k1. Row 18: p5, (k1, p1) in double yo, p2, *(k1, p1) in double yo, p2, (k1, p1) in double yo, p10, (k1, p1) in double yo, p2; work from *, (k1, p1) in double yo, p2, (k1, p1) in double yo, p5. Row 19: k2, yo, ssk, k6, *k6, k2tog, yo, k4, yo, ssk, k6; work from *, k6, k2tog, yo, k2. The first digit of unicorn is 3, so I count three squares. Then I fill the next square with black to show that I counted 3 for the first digit. The second digit is also 3, so I count 3 squares, and mark the next. The fourth digit is 2, so I count 2 squares, and… oops! No more room on this row. However, I jump up to the right end of the next row and mark the next available square with black. The fourth digit is also 2, so I count two squares and mark the next. And so on and so forth. The blank squares in the upper left don’t matter for the code, since there’s not a black square at the end to indicate that they’ve been counted. Once I marked out these grids, I mirrored them along the vertical axis. Then I added plain wrong side rows, replaced each black square with a yarnover, and spent a lot of time swatching to figure out where I wanted to place the decreases required to make a standard rectangular stitch pattern from the charts. Finally, I added a second repeat above the first and offset it halfway.